a) Parking areas that are not considered an open parking. 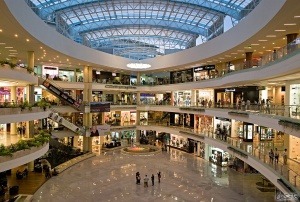 b) Establishments for commercial use or public facilities whose occupation exceeds 1000 people. c) Atriums when their occupancy in all areas and plants in the same fire sector exceeds 500 persons or when it is intended to be used for the evacuation of more than 500 persons. 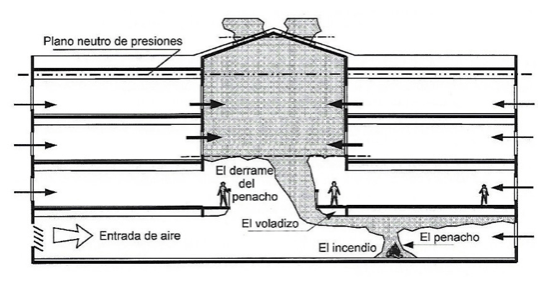 Regarding the required evacuation surface of smoke AvCv, it will be made according to the standard UNE 23.585, having as a main hypothesis of calculation allowing people evacuation, and serving also as a system to control the temperature of the fumes layer and avoiding the collapse of the structure, as well as to avoid the “Flash Over” or the generalized sudden combustion. On the other hand, its use facilitates the rapid intervention of fire extinguishing services by creating a smoke-free space in which to be able to visualize the fire’s focus and to stifle it more quickly. This standard indicates that the minimum clear height (without smoke) above the evacuation routes must be 3 m. Also we have to take into account that the smoke deposits can not have a surface bigger than 2,000 m2 in natural evacuation, nor exceed 60 m. in its axis of greater dimension. This is to prevent the fumes from cooling down and lowering making the system unusable. With these calculation hypotheses and considering that the fire is going to occur in the most unfavorable place, we can calculate the amount of smoke that is generated that will depend on the heating power of the combustible materials. Also we take into account that the smoke column collect large amount of outside air while changing direction or ascending, while it barely collects air when going horizontally. We can calculate the smoke deposits and the surface with a series of formulas collected from the standard, we can calculate the smoke deposits and the smoke evacuation per deposit necessary for the system to work and to avoid that the smoke temperature was not so enough high to collapse the structure, nor so low that the fumes didn’t rise and again obstruct the escape routes. On the other hand, if the spill of the plume as shown in the chart below is very large and we are not interested in it for calculation purposes, so if it is too cool the layer of fumes we can place channeling screens to reduce this distance and it will have much less clean air intake. In the Technical Department of MercorTecresa, we carry out these calculations, according to regulations, dimensioning the different smoke tanks to achieve an optimal Smoke Evacuation System in case of fire, as we have been doing for almost 20 years. Of course, also from our works department we make its correct installation and the subsequent system maintenance.